Okay, here is a quirky little bit of Jackie info. I’ve been collecting metal lunchboxes since college. I don’t have a huge collection, maybe half a dozen or so. It started when I was in the midst of my undergrad degree and I went into Junkman’s Daughter’s Brother in Athens, GA. This is one of those stores that has everything from costumes to Hello Kitty stuff to metal lunchboxes. 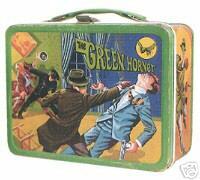 I bought The Green Hornet, which turned into my signature college accessory. I took it everywhere, and I was even introduced to strangers once or twice as “the girl with the hair and the lunchbox.” Now, remember that I was an art student in college, and in addition to this lunchbox I could also be seen sporting a bright red trenchcoat and red argyle knee socks. And wild curly hair. I was fearless. This doesn’t mean I was extreme. I looked “normal” most of the time, wearing my standard-issue sorority letter t-shirts and sneakers (I spent a lot of time in public wearing pajamas, but so did every other college kid). But the lunchbox was always around, and I carried it a lot after college and just continued to add more lunchboxes to my collection. I still have the Green Hornet, although the clasp isn’t what it used to be and can’t actually hold things closed anymore. I will be 30 years old in February, and my overall look is a lot more chic and put together than in my days of the red trench and Green Hornet lunchbox. I still have crazy hair and a funkadelic personal style, I just grew up. So now I’ve just started this job, and everyone seems to bring their lunch. I had long stopped doing this as takeout places and time were abundant in my past jobs. With 30 minutes for lunch and a building deep in suburbia, finding a place to eat out is not going to happen. But I feel a little old to be carrying metal lunchboxes. I brought my Tootsie Roll lunchbox for my first day, and I was surrounded by a table full of female teachers eating out of smart insulated lunch bags. 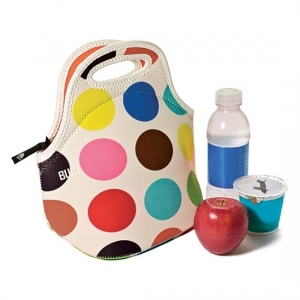 Not only were their bags smart, the lunches were, too. Soup, leftovers. I brought a peanut butter and jelly sandwich and a fruit cup. I need to step it up here. I may not stop bringing fruit cups and PB&J sandwiches, but I need something infinitely more sophisticated than Mr. Owl and The Green Hornet (I don’t think my Tomb Raider, Spiderman, Christmas Story, or Beatles lunchboxes will work, either). But I do like to stand out–it needs to make a statement while sitting in the faculty fridge. Mario Batali has a line coming out in October if I can wait that long. These Built NY bags are extremely promising, but I can’t decide. This is a tough decision. I’ll keep you posted.